With the uncertainty of steel and aluminum prices fluctuating into unknown territory, many companies have begun to look at the benefits of reducing their part costs by investing in sheet metal material storage and warehousing systems tied to their fabricating equipment. With recent steel and aluminum prices fluctuating as they have, and for the foreseeable future with recent trade tariffs on imported steel and aluminum, the metals market situation does not look to be getting any better. Most companies rely on their just-in-time deliveries from their local steel supplier and keep just enough inventories to maintain production levels on a weekly or bi-weekly basis knowing that more material is just a click or a phone call away. If you are a preferred customer then you are probably receiving a discount from your steel supplier. Problem is you are probably paying the prevailing market price for each steel delivery, which at this point is a bit too risky for most companies; and are also paying delivery, handling and fuel surcharges on top of that. This adds up to a lot of unnecessary expense. What if you could buy your sheet metal in bulk when material prices are lower and then not only receive a lower price but more than likely a higher discount for a volume purchase? But then where would you store it? If you store it on the production floor this takes up a lot of expensive lateral real estate. It is also very inefficient when you need to access the material, especially when it’s located behind another stack of material. The solution is an automated material tower or warehousing system that not only enables you to store bulk sheet metal purchases, but also eliminates wasted valuable production floor space. Instead of lateral storage, the materials are stored in vertical towers containing automated shelves. Accessing the materials is just a click away from your automated material tower or warehousing system and delivered directly to the required machine location. You now have peace of mind for fluctuating market condition prices, are able to deliver parts faster and less expensively, are more efficient with material handling and will most likely win more business because of it. With today’s Fiber laser cutting machines and their capability to process a vast amount of sheet metal on a daily basis, maintaining materials at the ready is essential to maintaining a consistent pace of production. It is equally important to have some form of material automation for loading and unloading sheet metal so that the raw materials are cycled to the machine in a timely manner. Automating the retrieval, load and unload cycles is the key to maintaining the productivity capability of today’s fiber laser cutting machines as well as other machines on the fabrication shop floor. 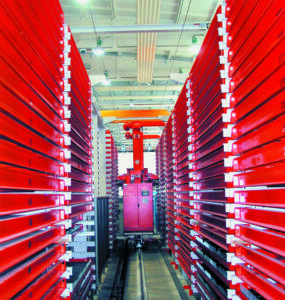 Success Story: A new Fiber laser cutting machine and automated sheet metal material storage/handling system enables Decimal Engineering to replace as well as complement some stamping operations.